Here in our new feature “Grateful Changemakers”, we celebrate programs and projects that serve as beacons of gratefulness. These efforts elevate the values of grateful living and illuminate their potential to transform both individuals and communities. Join us in appreciating the inspiring and catalyzing contribution these Changemakers offer to shaping a more grateful world. With many years of combined experience in long-term care reform and advocacy, Dr. Bill Thomas and Kavan Peterson founded ChangingAging to usher in a new culture of human aging. They have built a worldwide network at ChangingAging.org, which offers content that explores the terrain of aging, and through their nonfiction theater tour which travels the country and blends medical science, storytelling, and live music to shatter our culture’s damaging myths about aging. Their newest start-up “Minka Homes and Communities” is helping people live on their own terms with innovative houses that meet the needs of everyone. 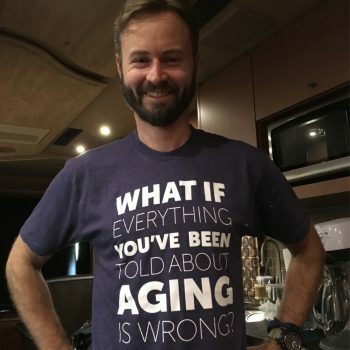 Co-founder and editor of ChangingAging.org, Kavan Peterson tells us more about how they’re working to create a culture of aging built around love, kindness, and gratefulness. What sparked the founding of ChangingAging.org, the tour, and Minka? There has been an interesting movement for almost three decades, built around changing the culture within our long-term care system. ChangingAging was specifically a movement that Dr. Bill Thomas and I launched in the mid-2000’s with the idea that we could leverage new tools, like social media technology, to introduce a broader range of people to this culture shift. For the most part, people avoid thinking about aging and avoid experiencing places like nursing homes unless they’re forced to do it, so a lot of people don’t know about this movement unless they work in senior services directly or they have a loved one who gets old and experiences the current long-term care system. We recognized that it’s great to share information and be connected digitally, but if you want to change people’s minds, you have to change their hearts. Dr. Bill Thomas and I were looking for a way to have a broader impact, to reach more people, and to change the way they thought about aging, both on a personal and societal level. The ChangingAging platform initially was a digital platform that we built into an international following. We used that platform and following to combine the digital experience with a live in-person experience — the ChangingAging Tour — so that we could impact greater social change. We recognized that it’s great to share information and be connected digitally, but if you want to change people’s minds, you have to change their hearts. The most powerful way to do that is through in-person engagement, leveraging the tools of theater and the live experience. It’s a lot more impactful than a Facebook post. The Tour gave us this unprecedented opportunity to travel around North America. We partnered with long-term care organizations like AARP, so we had a mandate to convene community conversations at all 130 of our tour stops where we were could either bring together and introduce age-friendly community-building concepts or where there were age-friendly communities already underway and we could support their efforts, connect with them, and provide an opportunity for the community to celebrate. We want to listen to people and ask them about the issues they care about as well as their hopes and dreams for their own aging. In almost every community that we visited and every conversation we had, the most urgent issue people talked about was housing and security. It’s important for us to recognize that longevity is a huge success, and so rather than always framing it as this problem that old people cause, we need to recognize that we can learn from this experience, to create better communities and better homes. This is an opportunity now — rather than do nothing and let millions of people suffer by having inadequate housing and inadequate communities — to start this age-friendly revolution and design our homes and communities so that they are more supportive of what older people need. Out of this experience of traveling around and hearing what people were concerned about, we launched a company called Minka that has designed houses that can be built very fast, that can be built anywhere, and that can be assembled in people’s backyards or as whole communities where every house is visible, universally designed, and digitally connected to meet the needs of people of all ages. One of things we developed as a sort of model for our design is this acronym called MAGIC, so that whatever we’re doing, it is in support of Multi-Ability, multi-Generational, Inclusive Community. How does ChangingAging disrupt ageism? Part of creating ChangingAging was the recognition that the problem is not old age. The problem is not what happens when you grow old, even the negative things. The problem is not the policies and the regulations and the negative things within aging services and the long-term care system. There are issues there that create institutional settings that people don’t thrive in, but those are not the real problem. The core problem that needs to be tackled is rampant ageism within our culture. All of those negative things are symptoms of a culture that is too consumer-based and too focused on portraying youth as the pinnacle of perfection. In the past 50 years in our culture — this is my opinion and an opinion shared by others — our hyper-consumerism created this cultural effect that looked at youth as perfect. That’s just ridiculous, because youth is totally flawed. Even the fiercest advocates for people who live with dementia and Alzheimer’s disease can be responsible for creating this narrative of tragedy and loss that demeans and dehumanizes, causing people living with dementia to suffer. ChangingAging and this idea of disrupting aging has really been about looking at different ways to get people to see beyond their own ageism, a socially imposed ageism. It’s easy to point to the highly visible examples of age discrimination. We know it happens. We know that women are dramatically more impacted by it. They feel more pressure to maintain this illusion of youthfulness in order to be visible in society. That’s a real pressure. But ageism goes way deeper than that. It really permeates everything we do and everything we think about aging. 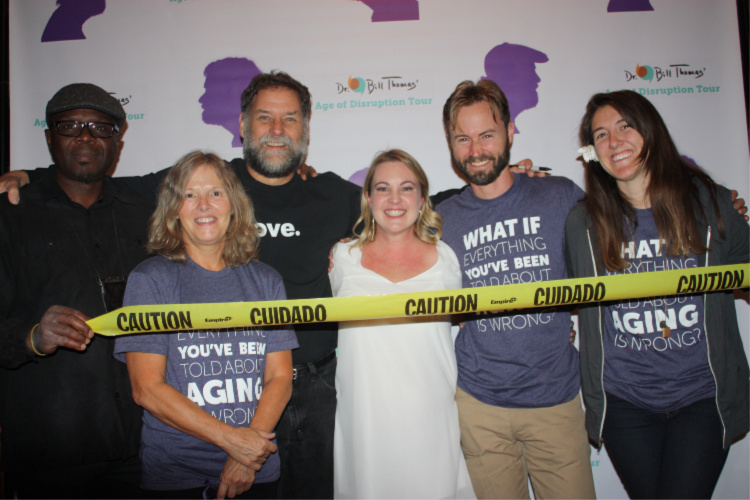 ChangingAging and the ChangingAging tour has had this mission to disrupt ageism. In particular, a big part of the tour that’s now shaping the housing and the community development work has been the idea that we could even disrupt dementia. We took the idea of disrupting aging to the next level, saying, “Okay, if we’re going to really address people’s worst fears about aging, let’s talk about losing your memory.” For many people, that is the ultimate thing that they fear — losing their identity and their memory. Because of that deep-rooted fear, we culturally treat people who experience memory loss very badly. Even the fiercest advocates for people who live with dementia and Alzheimer’s disease can be responsible for creating this narrative of tragedy and loss that demeans and dehumanizes, causing people living with dementia to suffer. ChangingAging has had this mission to be the leading voice, saying we can disrupt this tragedy narrative and tell a different story about mindfulness and presence as valuable attributes that we can actually learn about from people who experience cognitive change or memory loss. How do you see ChangingAging as being connected to grateful living? When you live with dementia you do experience cognitive losses, but you gain other heightened senses to compensate. It’s well documented. You gain a heightened ability to communicate and recognize people emotionally, an ability that comes from basically being only in the present moment, grounded in ways that people with hyper-cognition are incapable of. A lot of the difficulties in communication and our interactions with people living with dementia is because we have such a hard time being present. People living with memory loss are perfectly present and tuned into our — that is, people with hyper-cognition — lack of attention. We found that by spending time with people living with dementia, inviting them to share their stories, and weaving those stories into our performances, we have been able to disrupt this tragedy narrative, which has had a ripple effect of dramatically changing the way people think about aging in general. If you can demystify and reduce their worst fears, you open space for a richer understanding of aging and less fear and denial about what’s going to happen when they age. The reception of the Minka houses has been overwhelmingly positive. I think there is a growing niche movement obsessed with downsizing and obsessed with minimalism. It is not a tiny house, but it’s tiny by American standards –the smallest model is 425 square feet. I think there’s a lot of evidence as we grow older and wiser, we learn profound lessons about contentment. One of the things I’ve learned from elders is that I have so much to look forward to in terms of getting older and gaining that ability to be more content with the things that matter most. One of the things I’m grateful for: I get asked often about why I love working in aging and with older people so much — is because it makes me hopeful for my future. One of the things I’ve learned from elders is that I have so much to look forward to in terms of getting older and gaining that ability to be more content with the things that matter most. I still suffer from wanting things, but I recognize that it’s understanding what matters most in life that enables you to be more content. Dr. Laura Carstensen, the founder of the Stanford Longevity Center, was the first researcher to show evidence that we actually get happier as we get older, specifically as we age into our 70s and 80s, which is when most people assume life is horrible. The reality is that life experience gives you the insight and the wisdom to be profoundly happier and more content than younger people. Those are the lessons that we’ve tried to embody in our innovation and in our work, and that has really inspired the ethos of Minka. How does ChangingAging inspire love, compassion, and gratefulness? One of the workshops we’ve done to design our approach to building communities was a Disrupting Dementia retreat we did with a group of people living with dementia, exploring what they wanted their future to look like. They wanted to design communities that accepted them. We did several exercises to create those communities. The core theme was that they wanted to live in a kind and inclusive community. Love is the driving force behind combating ageism. When it got right down to it, they wanted to love and be loved. All of ChangingAging’s performances, all of our advocacy, all of our innovation is driven at its core by love. 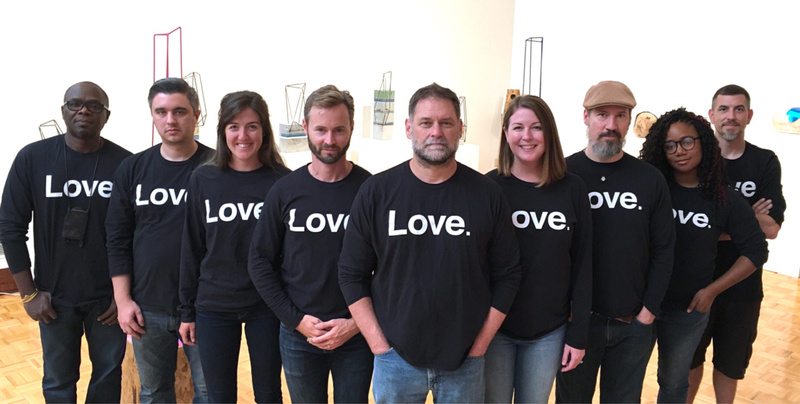 Our tour shirt is just the one word L-O-V-E spelled out. That’s what we all wear when we’re on the road and when we’re performing on stage. It’s love. Love is the driving force behind combating ageism. I think that we are deeply aligned with the idea that grateful living requires deep compassion and love and rejects the opposite of those values. I think that ChangingAging’s stories, content, and our innovations are deeply aligned with gratefulness and grateful living. What do you think inspires people to attend the ChangingAging tour events? Most people expect a lecture by this world-famous expert (Dr. Bill Thomas). 75 percent of people who come to the show are women who represent the daughter responsible for the care of aging parents. It’s just a fact in our culture that that responsibility falls predominantly on daughters. In fact, there is a statistic out there, if you want to know what your chances are of avoiding institutionalization as you get older, the number one metric is how many daughters you have. Those are the people who are the most touched by the system and the people who have experienced the system, the long-term care system. They are the ones inspired to come to our show because they know of Dr. Thomas’ reputation, so they come expecting a lecture, you know, education about his work. What they get is a deeply, deeply emotional, transformative experience where they are profoundly challenged to think differently about their own experience of aging. That is why that quote embodies most people’s experience. It’s not what they expected, it’s what they needed. The other people who come are our favorite type of audience members, which we call the dragged-alongs. This movement is grassroots, and we build every audience by hand. We’re rock stars in our tiny little world of aging, but we’re not legitimate rock stars. We have to drag people in. We challenge all of our fans who know about Dr. Bill Thomas and who want to come to the show to drag along friends and family members who normally wouldn’t come to something like this. Those people — who never would have come to something like this — have the same profound experience. What do you see as the lasting impact of ChangingAging’s work? We really believe in both personal and community transformation. We go on tour and create these live events so that we can be with people and give them the opportunity for personal transformation. Then we build the network and leverage technology so that now we’re actually building homes and communities. We do believe that this issue around a growing aging population is a positive opportunity to build better communities. We think it’s an opportunity that could be lost if we do not act. If we are apathetic about the situation, our communities will get worse. We have a unique opportunity to transform our communities for the better if we embrace the idea of bringing elders into the center of our community. 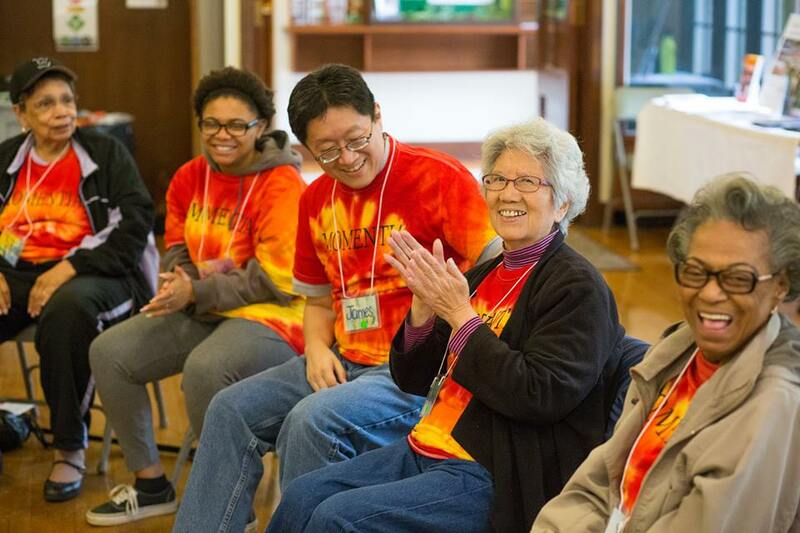 In our opinion, humans have evolved in a way for millennia that has put elders at the center of our communities, and they have always been the glue that has held people together. We’ve had this weird experiment for a few decades in which we removed elders, institutionalizing them and segregating our communities, and I think there’s a lot of evidence that it’s not turning out very well. I don’t want to be hyperbolic, but if you look at experts like Robert Putnam, author of Bowling Alone, who has looked at sociological changes in our culture, a distinct decline has been measured in the social fabric that holds us together, a decline in the social capital that can help people thrive and be more connected. We believe that creating communities where older adults are included and recognized not for what they consume or do — which is how we measure the worth of younger people — but instead are measured by their wisdom and their storytelling, we will increase social capital which is actually more valuable than financial capital when it comes to thriving as we age. What are some of the challenges that ChangingAging faces in terms of accomplishing its mission? I know that people who work in the field of aging and long-term care understand that there are some hurdles. There are some people who select to live in a retirement community, but we’re deeply, deeply, involved in the senior housing and senior services community. We work with them closely, and they have been in a crisis for several years because the emerging cohort of older adults absolutely rejects the status quo of segregated retirement communities. There are two ironies here that are really critical. Technically speaking, there’s this incredible shortage of senior housing and senior services. There’s a housing shortage of segregated housing for older people. And there’s a labor shortage. But senior housing centers can’t fill the rooms because nobody wants to live there. Everybody recognizes that people do not want to live in segregated communities, yet it’s very difficult to change this model. It’s like turning the Titanic. Everybody recognizes that people do not want to live in segregated communities, yet it’s very difficult to change this model. It’s like turning the Titanic. It’s a massive multi-billion dollar industry. It’s really important to not “catastrophize” what’s going on. But we’re trying to meet the urgency of the crisis by innovating something that can be scaled rapidly, and that’s why we have this emphasis on houses that can be built very fast. I can absolutely tell you that we’re getting our butts kicked by ageism every day. It is a powerful force that impedes our progress. If you talk to somebody like Dr. Bill Thomas who’s been doing this work for 30 years and has had world-renown success, he will tell you that the successes he has had have not been impactful enough because they have been dramatically limited by ageism. We can create cool models and innovations, and yet we can still fail to change our broader culture. It’s a profound challenge, and the forces against us include the economy and mass media. I think that ChangingAging has the power of networking and sharing stories. There’s a worldwide audience with people experiencing and contributing to our content. I think the live performance is an important, powerful experience. Then Minka homes and communities are tools we have with which to create concrete change. What inspires you personally about this work? In my own life, I am part of a community in Seattle called Momentia. Momentia is a community of people who live with dementia and memory loss and who have come together, reclaiming the word and the entire experience. I’ve been inspired by this idea that we can create our own story about our experience, whatever it is. Momentia specifically inspired this Disrupt Dementia movement and the community design work that we’re doing to create dementia-friendly and Minka communities. Momentia is a community of people who live with dementia and memory loss and who have come together, reclaiming the word and the entire experience. I’m inspired also by Dr. Bill Thomas’ family. The prototype Minka was built for Haley Jane Thomas. She’s one of Bill’s daughters who was born and has lived with a profound neurological disorder called Ohtahara Syndrome that arrested her development in infancy. She is nonverbal, blind, and limited physically. I’ve known her since she was 11. Haley is in her early 20s, and she now has a Minka house of her own designed to meet her needs with all of the best design and technology available. Her entire life, she’s been an inspiration to Bill, his wife Jude, and everyone in our world that has done this work. They all have inspired us to create better communities and services. Haley is a lead inspiration. How does ChangingAging plan to grow or expand? We have several Minka communities in the works now. The next phase for us is definitely going to be having a presence in these communities. I don’t know exactly what that’s going to look like yet, but that’s going to be the next phase of these new age- and dementia-friendly co-living communities. The MAGIC concept was developed in partnership with a community in Evansville, Indiana, which included the University of Southern Indiana and a broad range of community participants. We brought the ChangingAging tour there, and we had multiple community events. The first MAGIC Minka village will be a co-student/elder housing community at the University of Southern Indiana. The first of its kind in the world. On Oct. 24, 2018, we unveil the first MAGIC house, and then we’re building the community. If you could encapsulate one message for people who benefit from ChangingAging’s offerings, what would that be? ChangingAging offers people stories about lifelong development and the discovery of new possibilities at every age. For us aging is the name we give to growth when we are no longer young. How does gratefulness inspire you to make change in the world? I think in our field of work, the gratefulness that we experience working with elders is the primary inspiration that drives our work. There is gratefulness for the fact that we live in an era where so many people can successfully live this long in life. Elders have so much to share. My mom just retired in May after 35 years of running a nursing home. A lot of people come into the field of aging and long-term care because of experiences, especially bad experiences, they had with family members or relatives in the long-term care system. I came into it having grown up in the field — elders are the people that I hung out with growing up and people that I loved. I know that I, as well as Bill and others who do this work, are driven by our gratitude for having been able to spend time with elders in our community. That is absolutely the thing we’re most grateful for. To learn more, visit ChangingAging.org.